Are you looking for a fun way to bring St. Patricks day into your home? 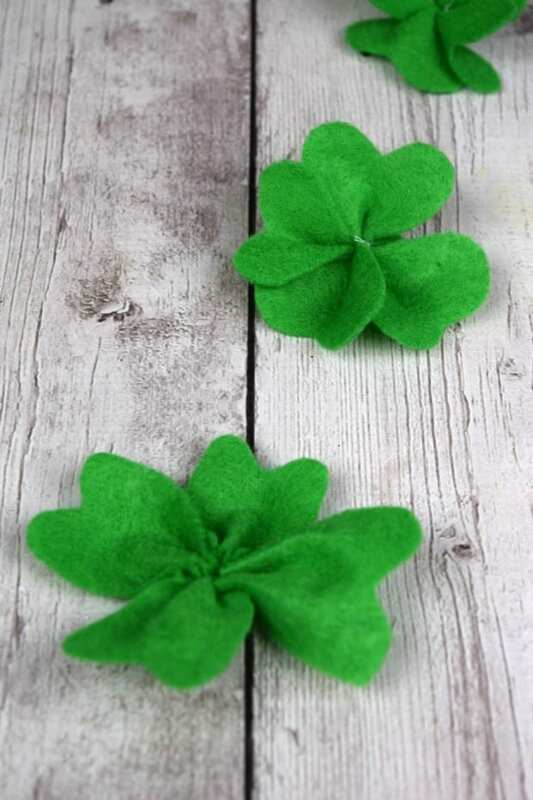 These oh so easy DIY Felt Four Leaf Clovers are so fun to make and a great project to get the kids involved in. 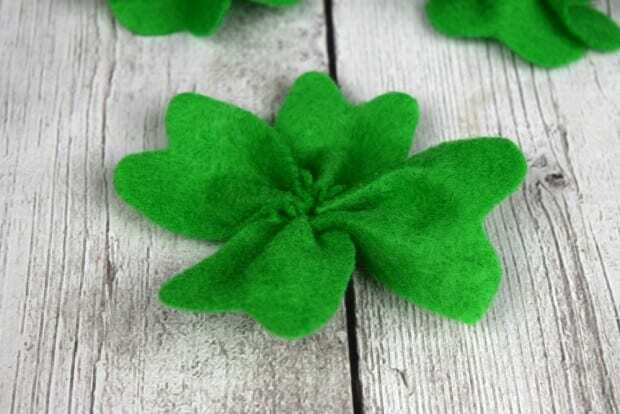 Just grab a piece of green felt from your local Craft store for less than $0.60 and make up as many as you want. Best of all you can get creative and make them as large or small as you want them. Enjoy this tutorial. This project is so easy to do as I mentioned and takes very little time to complete. Grab your green felt and cut it up into strips. Cut the strips into the same size squares across the way I was able to get 6 squares from one strip. 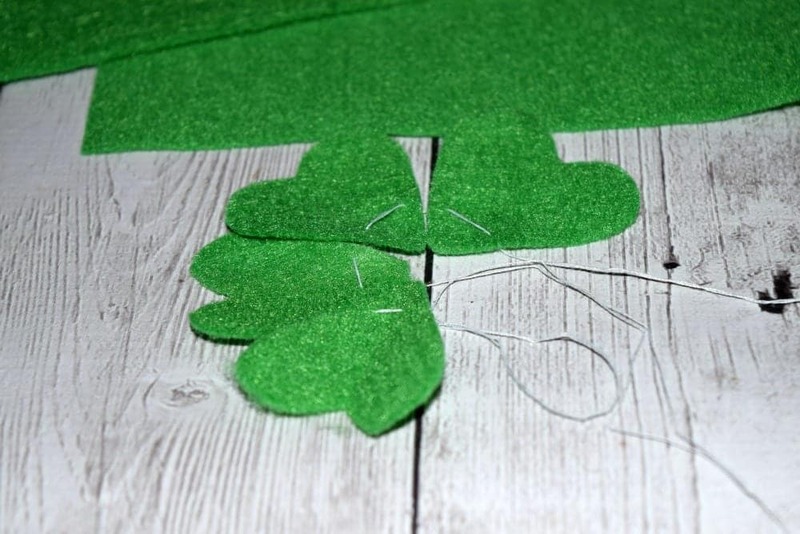 Fold the squares in half and cut a heart shape out of each square to make it the perfect shape for a four leaf clover. 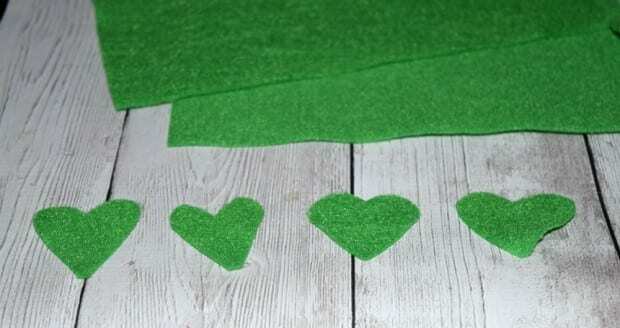 Tip: I also cut some with a heart top and a flat bottom to give my four leaf clovers a different and unique look, this step is completely optional. 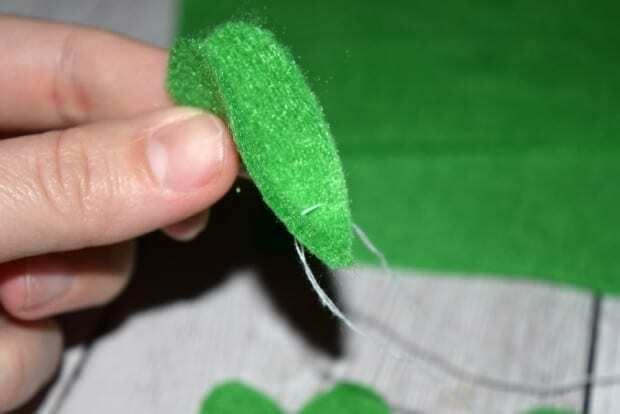 When you have your “clovers” cut out just thread them with your needle and thread until all 4 are together. Now cut your string from the needle and pull the two strings together at the bottom and tie two knots tightly. Now all you need to do is shape your clovers to stand the way you want them to and they're complete. 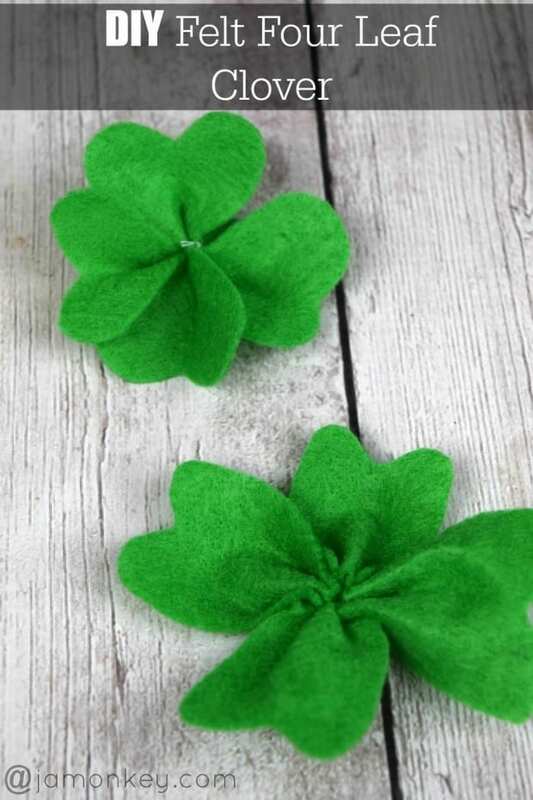 I was able to make three DIY Felt Four Leaf Clovers in a matter of 10 minutes. How cute and easy are those!? You can put these on hair clips, clothing and more. Perfect so you don't get pinched on St. Patricks day! These are so cute! I might have to do these with our Girl Scout troop! How cute are these?! What a fun and simple activity for Saint Patrick’s Day. Thanks for sharing with us at the Inspire Me Mondays Link-Up. Have a great week! Neat idea! Reminds me of when I was at school (long ago in the 1960s!) I discovered a clump of clover which only grew four leaf clovers (there were some three leaf ones too. Kept the secret close until I left the school (sharing it with close friends only). When I went back to the school in 2010, alas, the mowers had destroyed the clump!! Such a cute and inexpensive St. Patrick’s Day craft to make! LOVE IT! Visiting from the Wow Me Wednesday Linky party!